is a must-visit, at least once, whether you’re a local in Malaysia or a tourist from another country. 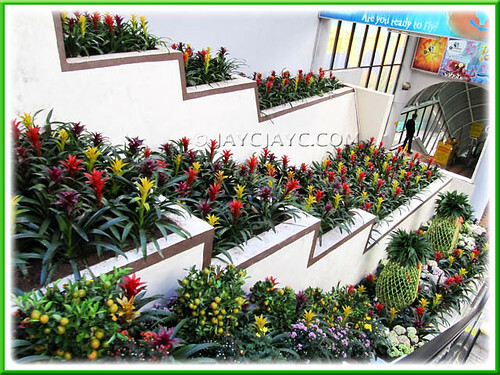 Popularly dubbed ‘Genting, the City of Entertainment’, this magnificent hilltop resort that is approximately 2000 meters above sea-level, atop Genting Highlands in the state of Pahang, is Malaysia’s favourite family holiday destination and a key tourist attraction. An eleventh-hour decision enabled John and I to spend a night at Resorts World Genting recently with our family dirt cheap! 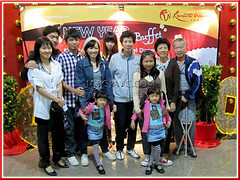 During the last decade, whenever feasible, we’d like to have our Chinese New Year (CNY) eve reunion dinner at the cool and breezy Genting Highlands Resort where temperatures are no higher than 25°C, stay the night to enjoy the international show if any, have fun the next day at the indoor and outdoor theme park if weather permits and indulge in a hearty buffet lunch before returning home in the evening of the 1st day of CNY. A short holiday getaway to spend quality time with family instead of cracking our heads with the hustle and bustle of open house for CNY. This year however, as John’s 87-year old mum who has been residing with us since last October is somewhat homebound due to ill-health, we thought our usual annual plan was unlikely. Fortunately, her daughter was willing to relief us for a day or two provided we take mother back before 4.30 pm on the eve of CNY as she had other engagement. This meant that we had to celebrate our eve reunion dinner a day earlier, instead of February 2nd. Whatever, it was truly a blessing in disguise because while trying to book online on 22 January at RW Genting’s iHoliday site, we found out that February 1st was considered off-peak season and it cost only RM48/night for a Standard View Room inclusive of breakfast for 2 persons at First World Hotel. 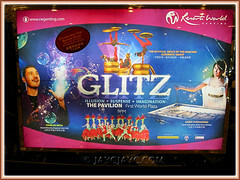 The best part was there was a show package too that cost only RM70/adult and RM35/child that included a show ticket for the international show, GLITZ and a buffet meal at Genting Coffee Terrace. Fantastic offers! Getting there is hassle-free, check out the many alternative ways! Our sons prefer to drive up to Genting which is 51 km northeast of Kuala Lumpur and less than an hour away. John and I would rather drive to Terminal Putra LRT Gombak, park our car there and board the Genting Express Bus Service which takes only about 45 minutes to Genting Skyway. From there, we’ll take a 20-minute ride in the Skyway cable car to the peak, enjoying the breathtaking scenery of the surrounding hills and the evergreen tropical rainforest along the way. The on-and-off mist and cloudiness lends a mystique aura to the wonderful environment. Genting Skyway is recognized as the longest cable car in Malaysia and Southeast Asia, spanning 3.38 km from the midhill at Gohtong Jaya to Highlands Hotel at the hilltop. At a maximum speed of 21.6km per hour, it is ranked as the world’s fastest mono cable car system. A ride, not to be missed! Rooms are aplenty at Genting with 6 hotels to suit one’s lifestyle and budget, ranging from 5-star to more affordable accommodation. We chose to stay at 3-star First World Hotel and were delightfully surprised that all 4 Standard Rooms booked online were upgraded to Deluxe Rooms with no extra charge at all by the gracious receptionist who attended us when we checked-in on February 1. First World Hotel, the world’s third largest with two 28-floor towers and a total of 6,118 rooms, has much to offer besides the attractive seasonal promotions. 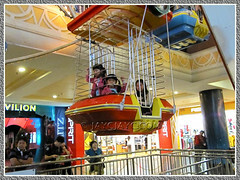 Adjoined to the First World Plaza which boasts of a Starworld casino, Genting International Convention Center, The Pavilion to stage international shows, Indoor Theme Park, Cineplex, Timesquare where entertainment-related performances are held, shopping arcade, restaurant and food havens, to name a few, it’s not surprising that this is where most visitors to Genting converge and appears to be abuzz with non-stop entertainment and activities round-the-clock! 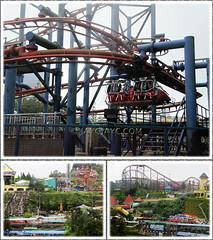 FWH is popular too because of its proximity to the Outdoor Theme Park. A pair of dragons at the main entrance of First World Hotel where the tropical rainforest is. valiancy and boldness, heroism and perseverance, nobility and divinity. At the First World Plaza where most of the fun, shopping, entertainment and food are! 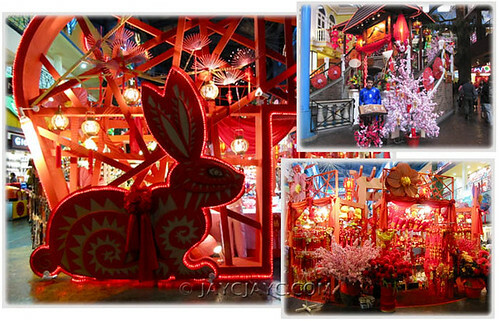 Decor incomplete if a rabbit figure to signify the 2011 Lunar Year of The Rabbit was excluded, right? connecting hotels in the Genting complex. Simply awesome! 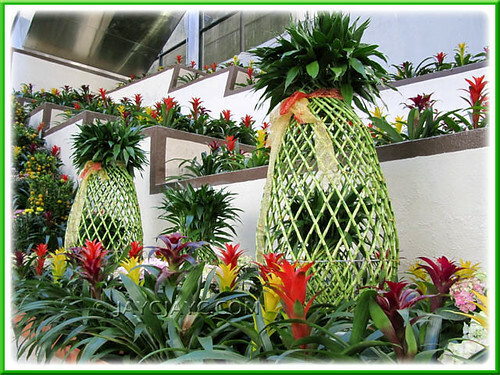 A closer view of the ornamental Lucky Bamboo (Dracaena sanderiana) and colourful Guzmanias. Just love these beauties! True to its name ‘The City of Entertainment’, Genting will host world-class shows, featuring international artistes all year round. 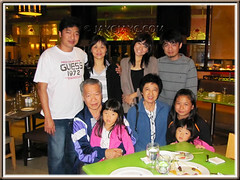 Many a time, it was such shows that beckoned my beloved John and I to have a quick 2D1N getaway to Genting. Not to be missed if you’re in Genting before 30 April as the attractive show package costing RM70 (rate for Genting WorldCard members) includes a show ticket and a buffet meal at Coffee Terrace which will usually cost an adult as much just for the buffet dinner. You’ll never be short of food havens in Genting. All kinds of food, glorious food…you see food at every nook and corner, so to speak. You’ll be spoilt for choices. If you eat smart and pay smart, it won’t dent your pocket much! 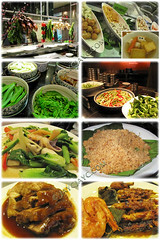 That was exactly what we did – went for the value-for-money GLITZ show package that entitled us a buffet meal at Coffee Terrace in the 5-star Genting Hotel. Thus, for our CNY eve reunion dinner, we ‘gorged ourselves’ with the impressive array of delicious local and international dishes served from six kitchens, namely Local Favourites, Nyonya, Japanese, Western, Chinese and West Asian. Thumbs up!! 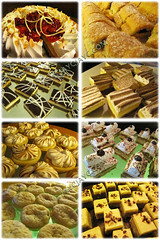 Just feast your eyes on the extremely varied and delectable dishes and desserts below, you’ll be overwhelmed, I think…hehe! 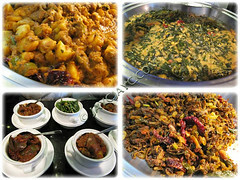 Western kitchen: mixed veggies and beans, chicken ham/loaf, roasted lamb, etc. 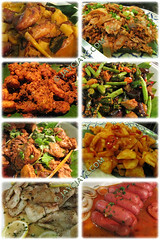 Local Favourites: squid curry, beef stewed, fried chicken, stir-fried veggie with belachan, grilled dory fish, pineapple achar, hot dog in tomato sauce, chicken/lamb satay, dried curry prawns, otak-otak, etc. 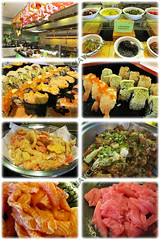 Japanese delicacies: sushi, tempura, pickled food, jelly-fish and seaweed, salmon and other raw seafood, etc. 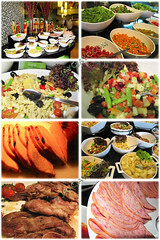 Buffet meals at First World Cafe and Resort Cafe are as lovely, though not as varied and with such grandeur…after all prices are about a third lower. 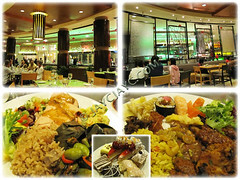 Whatever, Genting is a food haven with endless dining choices to suit everyone’s budget. Do explore Resorts World Genting’s theme park site for greater details and be blown away. 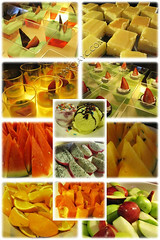 All in all, we did enjoy ourselves tremendously during this recent short stay at the cool and refreshing highland resort. It costed us less than RM700 to stay a night in Genting Highlands, enjoy a wonderful and jolly family reunion dinner at Genting Coffee Terrace, watch a remarkable show of international standard and have a very hearty breakfast the next day at First World Cafe. What wondrous blessings! We praise and thank God! This is a wonderful account of the splendid time you and John and family had at Genting Highlands. I’m so glad you had a terrific time there. Wow! Thanks, Autumn Belle! Enjoy your weekend, my friend! 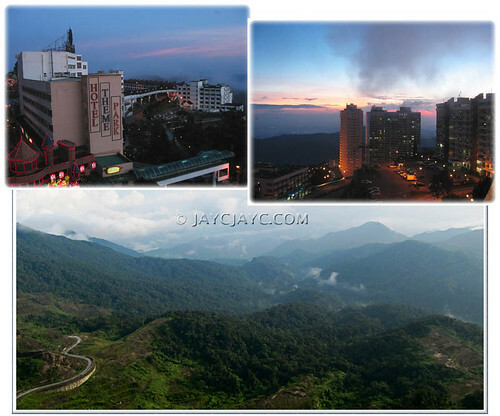 Wonderful write up on your holiday at Genting Highlands. I wish that I could go there one day. Thanks, Silvia! Hope you wish will be fulfilled soon…it’s a wonderful holiday destination that has much to offer!